On February 6, 2002, MBARI marine biologist Robert Vrijenhoek went looking for deep-sea clams in Monterey Canyon. Little did he know that he would stumble upon something that would change the direction of his scientific career. It was a dead whale, sprawled out on the seafloor. The dead whale was interesting, but what really got Vrijenhoek’s attention was what looked like red shag carpeting covering the whale bones. It turned out that the “shag carpeting” consisted of thousands of slimy, eyeless worms, lurking in the ocean depths and devouring the bones of dead animals. The two species of bone-eating (Osedax) worms that Vrijenhoek and his colleagues found on that whale carcass belonged to an entirely new genus of worms. But they were just the tip of the iceberg. Over the next nine years, researchers around the world discovered nine additional species. 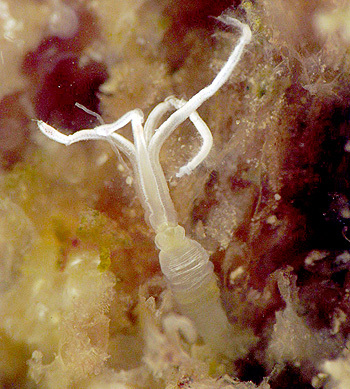 Now the researchers, led by marine-worm expert Greg Rouse from the Scripps Institution of Oceanography, have published a paper in Zootaxa that identified 14 new species of bone-eating worms from Monterey Bay. After their initial discovery of these Osedax worms, Vrijenhoek and his colleagues collected dead whales from the beaches of Monterey Bay and sank them at different depths in Monterey Canyon. Within a few weeks or months after these carcasses landed on the seafloor, sharks, rattail fish, crabs, and hagfish devoured the pale flesh. But these scavengers rarely ate the larger bones, so Osedax worms settled on the bones to take advantage of collagen within the bones as a source of food. 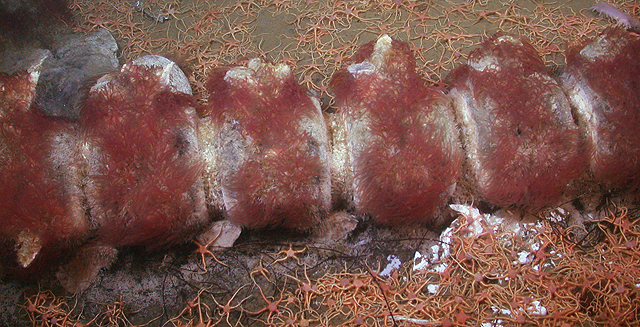 Other types of Osedax colonized the seafloor near buried whale bones. 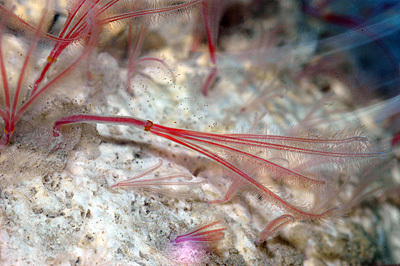 Using video from many remotely-operated vehicle (ROV) dives, the researchers could tell that a number of different types of worms had settled on carcasses at different depths within the canyon. However the actual process of naming these worms took over a decade of patient work, looking at the animals under microscopes and extracting and analyzing their DNA. Using these data, along with the results of other DNA analyses posted on the GenBank database, Rouse and the authors of the recent paper created an evolutionary tree that shows the probable relationships among all the different worm species known to date. In celebrating their achievement, the researchers named the new Osedax species after people, ships, and even robots that contributed to the research. Some of the new species were named after MBARI researchers and ROV pilots. 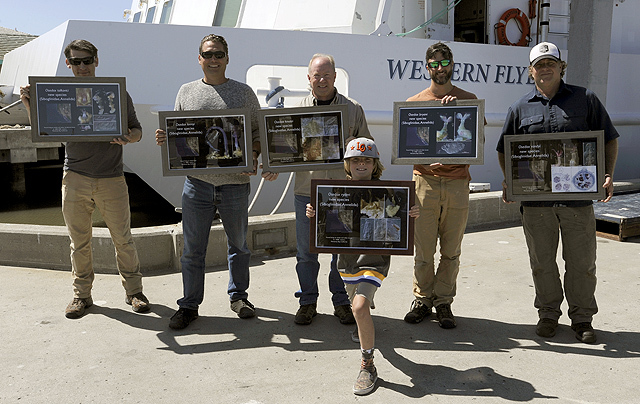 Other species were named after MBARI’s three remotely operated vehicles, as well as the institution’s flagship research vessel, the R/V Western Flyer. Once scientists knew what to look for, Osedax worms were found living on bones of dead animals in many parts of the world ocean, including the northeast and northwest Pacific, the northeast Atlantic, and the Southern Ocean. In addition to growing on whale bones, the worms have been shown to colonize the bones of fishes, sea lions, and elephant seals. The recent paper shows that they can also grow on turtles, turkeys, pigs, and cow bones that were placed on the seafloor by the scientists. The researchers suggest that being able to colonize a variety of animals has helped the worms spread widely, with some of the same species occurring in both California and Japan. Another sign that these worms are remarkably adaptable was the discovery of small holes and excavations probably made by Osedax worms in the fossilized bones of birds, turtles, and even plesiosaurs that lived during the age of dinosaurs, 100 million years ago. Most biologists would be thrilled to discover and name even one new species during their careers. Because there are so few experts and opportunities to explore the depths of the ocean, deep-sea researchers regularly find species of animals that are new to science, but have yet to be properly named and cataloged in natural history museums. Note: The title of this article (and the recent research paper) comes from a quote attributed to evolutionary biologist John Burdon Sanderson Haldane: “God has an inordinate fondness for beetles.” This tongue-in-cheek comment reflects the fact that there are many, many more species of beetles on Earth than there are species of birds, mammals, or other types of insects. Osedax sigridae – named for Sigrid Katz, whose Ph.D. project involved detailed study of the anatomy of this species. Osedax talkovici – named for Mark Talkovic, Senior ROV pilot for MBARI, who collected many bones containing Osedax over the years. Osedax tiburon – named for the ROV Tiburon, which was used to collect the first Osedax specimens. Osedax ventana – named the ROV Ventana, which was used to collect many Osedax specimens. Osedax docricketts – named for the ROV Doc Ricketts, which was used to collect many Osedax specimens. Osedax westernflyer – named for the Research Vessel Western Flyer, which has been critical to Osedax studies. who expertly collected many bones and Osedax over the years. Technician at MBARI, for his enthusiasm and assistance on many Osedax expeditions. Osedax ryderi – named for Ryder Williams, for his generosity in sharing his mom for our research efforts. Osedax jabba – The trunk of the new species is reminiscent of the tail of the mythical creature Jabba the Hutt from the Star Wars franchise. Ellen Lehman, in recognition of her long and continued support of the Scripps Oceanographic Collections. supports MBARI and enabled the discovery of all of the Osedax species in California. MBARI, who collected many bones and Osedax over the years. Technician for MBARI, who collected many bones with Osedax over the years. Dead whales that sink down to the seafloor provide a feast for deep-sea animals that can last for years. Previous research suggested that such "whale falls" were homes for unique animals that lived nowhere else. 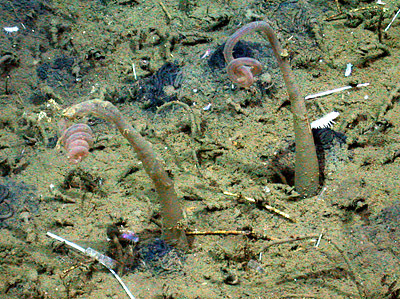 After planting several dead whales on the seafloor, a team of biologists recently announced that as many as 15 different species of boneworms may live in Monterey Bay alone. Scientists studying a whale carcass in Monterey Canyon recently announced the discovery of two new species of unique worms that feed on the bones of dead whales. This week MBARI scientist Robert Vrijenhoek revisited a dead whale carcass nearly 2,900 meters (1.8 miles) deep in Monterey Canyon.